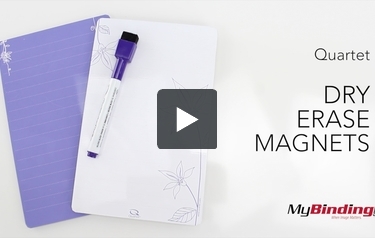 Organize your busy life with Quartet Dry-Erase Magnets. With a convenient size of 5"x 8", these magnetic dry erase boards are perfect for organizing details you would otherwise forget. Just stick these dry erase boards to any metallic surface like your refrigerator, and start writing grocery lists, family reminders, household tasks, messages, or anything that requires a written reminder in a convenient location. Quartet proudly stands behind the quality of every product they make, and these dry erase boards are no exception. Use for school, home, or business when you need to write it, post it, erase it and reuse it. Welcome to MyBinding video. These are Quartet Dry Erase Magnets. Each package comes with 2 magnets, a purple and a white one. The provided dry erase marker is also a darker purple. The eraser on the lid wipes it away. Here's a look at the build quality. It's actually pretty sturdy. The surface you write on is actually a painted metal. It's attached to a thick cardboard and then there's a magnet. The provided marker also has a magnet on it, though this magnet isn't as strong and it's going to fall off a lot easier. It may not do very well with high traffic areas but the boys themselves will do just fine. As you can see on the fridge they stay straight and don't move around. The provided eraser doesn't do an effective job of wiping away the marker totally clean. It'd be best to once in a while clean it away with a better wet wipe. Doing this will help avoid any permanent ghosting. And there's a look at the Quartet Dry Erase Magnets. For more demos, reviews and how-to's, go to MyBinding.com.